Here you’ll find a chattering, a murder, a wisdom, a charm . . . a gathering of hummingbirds, owls, crows, and various other birds as the branches thicken with feathers and sound. Here you’ll also find a growing throng of Visual Artists working in oil, acrylic, watercolor, and other media. One thing is certain, something about their art called to me. I hope you’ll experience the same enjoyment I do whenever I spend time with their work. When I came across Karen Walker’s paintings I was especially drawn to the vibrant colors and the interesting patterns in her work. That was before I’d heard of alcohol ink painting which, it seems, lends itself to those very characteristics. Although she is largely self-taught, Karen’s great-grandfather and her grandfather were both painters, so “the house was always full of paintings.” She likes subjects “that have space for abstraction and are at the same time recognizable” (like peacocks). That reminds me of a poem I wrote and how sometimes a deer is just a deer. Karen says her paintings sit between realism and abstraction and a very common theme when she teaches ink painting is “the cyclical relationship between spontaneity and control. . . . The magic,” she says, “comes in the combination and dynamic of the planned, hoped for and unexpected.” She teaches on-line courses and is part of a video project featuring peacocks created by 56 artists from around the world. You can watch the video here. When asked what she’s painting for, Karen replied, “I’m not sure there is a choice . . . painting is just part of me.” That comment speaks to me as a writer. I write because I must. I believe that’s often the case for artists, regardless of medium, creating is simply part of who we are. 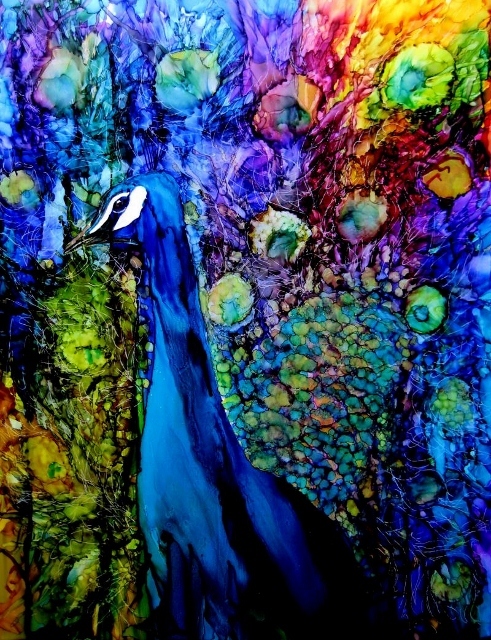 Technique: Peacock II, perhaps Karen’s most recognizable piece, was created with Alcohol Inks on Yupo paper (a synthetic watercolor paper). She uses a combination of masking, lifting, and directly adding ink straight from the bottles. Click on her bird to visit her website or you can also follow Karen on Facebook. Bridget Bossart van Otterloo ‘s “Protected” is the image representing art habitats here at Other Cool Birds in the special section Bird’s-Eye View. Bridget is another artist who has been interested in art since she was first able to hold a pencil. She fell in love with art way back then because it’s her favorite way of connecting with other people and communicating her love of the natural world. Her love of the natural world is obvious in her work. I was first drawn to the softness of paintings like “Release” and “Balance,” to the way she uses the background colors to set off the subject of the painting, but also to add texture and an element of softness. She has been wanting to incorporate more people into her paintings. During the summer of 2014, Bridget is traveling to Florence, Italy, to take a month-long figure painting workshop and visit as many art museums as she can. “This has been a dream of mine for some time and I am excited to finally make it happen!” I find it inspiring that someone as accomplished as Bridget would still seek out ways to learn more, to continue to grow as an artist. 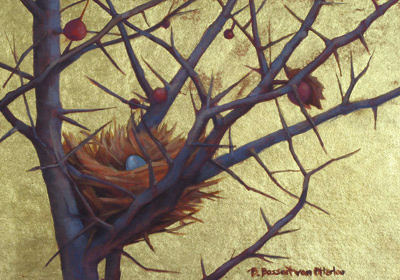 Technique: “Protected” was painted with oil paints and the gold leaf was applied around the painted subject. Anyone in the Elmira/Corning area during “Arts in Bloom” (April 26th & 27th) is invited to stop by Bridget’s studio. Rachel Rickert, a first year student in the MFA program at The New York Studio School of Drawing, Painting, and Sculpture has been interested in art as long as she can remember, but it was a special month-long trip to Sante Fe that she took as a sixteen-year-old with her mother that made her realize “painting was no precarious passion.” She wanted to be an artist! Rachel is painting, it seems, as a way to be herself. As Terri Guillimets put it, “Art is when you hear a knocking from your soul — and you answer.” Rachel has listened to her deep-down self and is answering and I admire her for that. If you get a chance, please be sure to click on Rachel’s bird and check out her other work. In some ways, she’s just starting out. In other ways, she’s really just settling into the person she’s always been. I for one am glad of that. 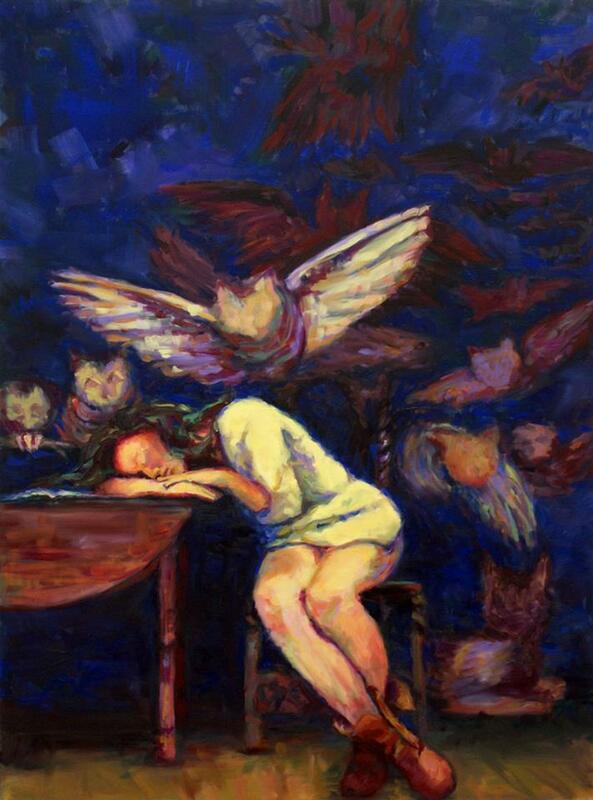 Technique: “Lost Dreams Run Scared” is an oil painting based off a Goya etching -“The Sleep of Reason Produces Monsters” – in which Rachel inserted herself. You can follow Rachel on Instagram for show updates and new work posted – (@rayrickk). For over a decade I’ve been drawn to the art of Marc Rubin, though it took me all that time to finally meet him. Within moments, however, I realized why his work speaks to me so profoundly. Rubin is a storyteller. With my writing, I tend to focus on misfits and outcasts. Rubin’s eye for the overlooked goes beyond people, though, focusing instead on the world around us, as he “pulls things from the debris of the world,” as he listens closely to the whispered stories of those things the rest of us often disregard, as he helps them “speak for themselves” by giving them a voice through his paintings. And what a voice!Despite his extraordinary talent, Rubin is a very humble man. His role it seems, is to notice and to share and, in doing so, to allow us another chance to notice for ourselves. Once he’s finished a painting, it’s no longer his. It becomes part of our story. 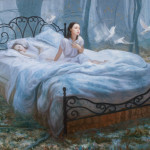 When you first encounter one of his paintings, see what story comes to mind. Then visit his other works and see if there might not be another story unfolding, one between the paintings. 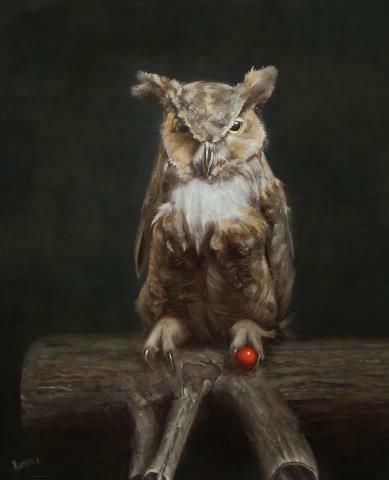 Click on “Spoils,” for example, the new painting Rubin has shared as his Other Cool Bird, and follow the red ball back to “Guardian – the previous painting in the series. What story comes to mind then? What story will come next? Editor-and-Chief of TheDetroiter.com, contributor for the art blog Hyperallergic, cultural critic for The Huffington Post, attorney and artist, you might say Colin Darke is a busy guy. Colin began drawing around the age of four and has been painting since he was twelve. Yet it took us all this time to discover him for ourselves. We’re glad we did. 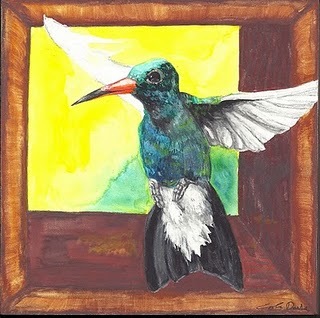 Colin’s series of hummingbird paintings titled Hope Against Odds is an example of an artist using his unique voice through colorful brushstrokes and subject matter to make a statement: in this case, a statement about Detroit. Hummingbirds, writes Colin, symbolize “hope against odds” and the juxtaposition of the birds “against abstract imagery of Detroit” intimates “that places change, but the human spirit is enduring.” Click on Colin’s Cool Bird and learn more about his work. GC Myers taught himself to paint. I find his ability to do that to be an envious gift and an inspiring one. There is something about his paintings that strikes me, not just on an aesthetic level, but on a personal one. 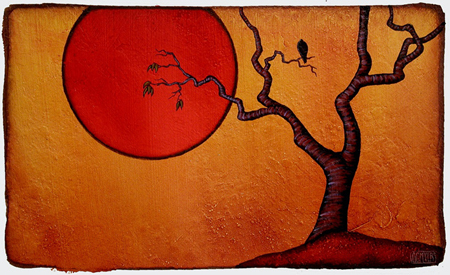 His choice of color and of composition is intimate and emotional and that comes through in the work. His transformation from hard-working waiter at a Perkins family restaurant to accomplished artist with a museum show later this year in Cooperstown wasn’t as simple as saying, I want to paint a red tree or a red chair and just having at it. He had to connect with his colors. But, even before that, he had to re-connect with a part of his authentic self that, like many of us, he had put aside. It took him years to give himself permission to pursue his passion full-time. We’re quite glad he did! To learn more about GC Myers click on his Cool Bird painting to be transported to a land of vibrant color and internal landscape.